Discover what’s in the pages of the new edition of ImagineFX! 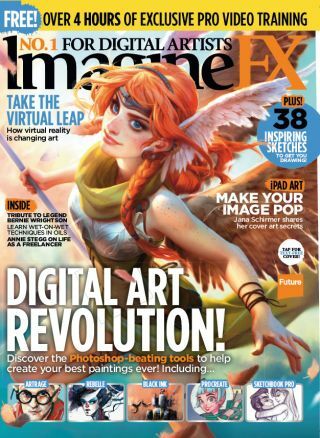 Spring is here, and so is issue 148 of ImagineFX magazine! The hallowed pages of our latest issue are all about the technical innovations currently sweeping through the world of digital art. It truly feels like the digital art scene is on the cusp of something transformative, so we thought we'd look at the software you need to be aware of. Buy issue 148 of ImagineFX here! As if that wasn't enough we're also looking at how virtual reality painting is set to shake up the digital art scene. Plus, we show you how to create a fantasy environment in black ink, and take a glimpse into the sketchbook of Romanian artist Cosmin Podar. You won't want to miss it! Explore the issue's main features below. Is it time for a digital art renaissance? The days of digital being monopolised by a couple of platforms are long gone. We take a look at the wealth of idiosyncratic yet powerful platforms that modern artists can use to meet specific needs. Is it time you traded in Photoshop for ArtRage 5? ArtRage 5 is a much more cost-effective alternative to Photoshop and other expensive digital art platforms, but does it deliver? Nick Harris thinks it does, and he's here to guide you through ArtRage's creative arsenal and new additions. Looking to inject some vibrant colours into your greyscale images? SketchBook Pro is the tool for you, and concept artist Trent Kaniuga is here to show you how it works with a tutorial that reveals how to create a colourful dragon. Is there anything more tantalising than getting a peek behind the scenes of how an artist works? In this issue we get a look into the sketchbook of Gareth Davies, who specialises in armour studies and robots. Wet-in-wet painting is a technique often used by watercolour artists, but people working with oils can use it, too. In this workshop, Rob Rey shows you how the method can achieve a unique, distinctive look.